Maryland Gov. 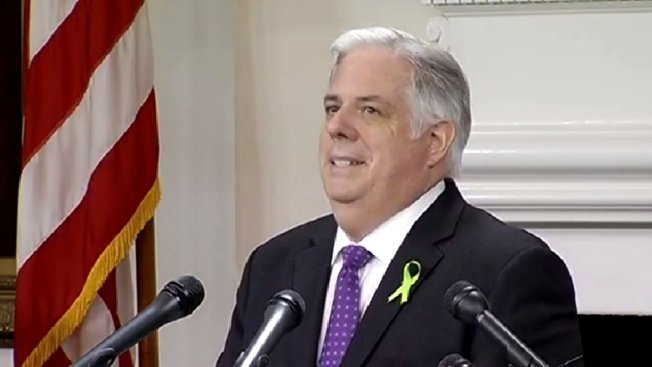 Larry Hogan underwent his first round of chemotherapy in the treatment of B-cell non-Hodgkin’s lymphoma. Hogan announced his illness at a press conference on June 22. At the time, he said tumors had spread through his abdomen and were pressing against his spinal column. Hogan said he was diagnosed after finding a lump under his chin while shaving. "They found 12 more of these things in my neck," he said. He said he had "20 or 30" more tumors in his core and groin area, adding he has been having many tests and procedures and that his team of doctors is treating his case aggressively. The governor said his doctors have told him he has a good chance of beating the disease. Hogan said he was “humbled, heartened and uplifted by the outpouring of the tens of thousands of prayers and well wishes from around the state” after the announcement of his diagnosis. He said he plans to work as much as he is able, describing himself as a workaholic. He said Lieutenant Gov. Boyd Rutherford will step up "even more," as will his cabinet.